We have really been enjoying our pressure cooker. 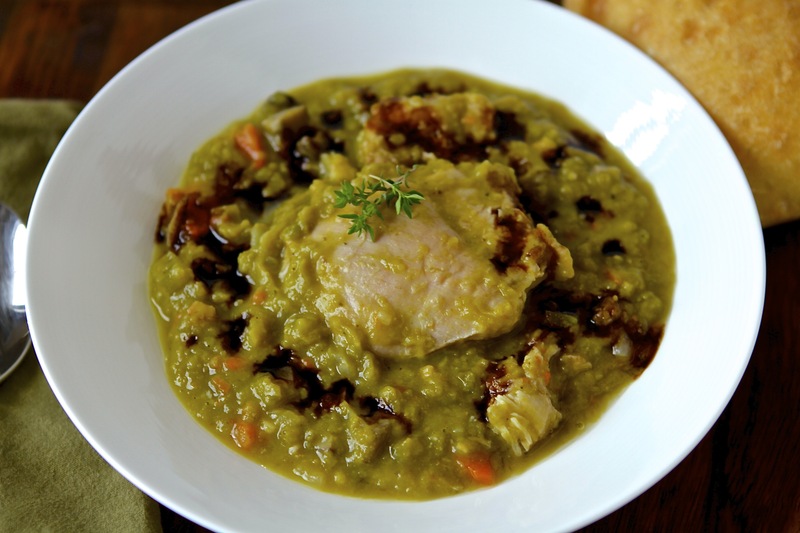 I think it really shines in a dish like this Split Pea and Chicken Stew. (I make this recipe multiple times a month with either lentils or peas.) In twenty minutes I have a dish that tastes like it cooked all day. I also love that I can sear in the same pot, unlike in my Tagine or slow cooker, making this an easy, one pot meal that the whole family enjoys. 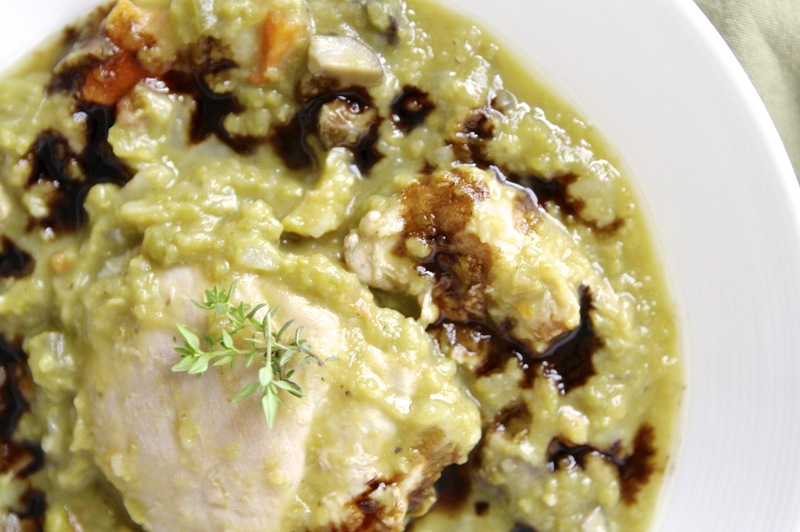 Combining the lentils or peas with a small amount of chicken really stretches the protein, making it very economical. And the small amount of pancetta is optional but adds a secret richness to the peas. The result: well, the next morning, Little Bird asked for “soup” for breakfast. In a pressure cooker, over medium heat, sauté the onions and pancetta (if using) followed by the carrots, celery and mushrooms, until soft, adding the garlic and any spices for the last minute. Add a splash of broth to deglaze, scraping up any brown bits from the bottom of the pan and mixing it into the broth. Add the rest of the broth, the split peas or lentils, chicken, and any herbs and spices. Give a quick stir and then cover and cook in the pressure cooker, according to the manufacturer’s instructions for 10 minutes at pressure. (At this point mine just starts to smell like split peas.) Allow the steam to release naturally (or quick release if you are inpatient like me.) Taste to check the seasoning, and adjust if needed. Serve with a drizzle of the balsamic vinegar. My family and I spent a sunny Sunday morning last week at the farmer’s market. Among other yums, both my husband and I were drawn to an unusual looking cauliflower at the Suzie’s Farm stand. It was a cheddar-orange colored variety called, well “cheddar.” I thought it was an heirloom, but upon research at home, it is actually a hybrid, but non-gmo seeds are available here. The color turned even darker when I cooked it and cheddar cauliflower naturally has 25 times the beta carotene of regular cauliflower, making it 2nd only to carrots. It made a lovely, simple soup! In a medium-large soup pot, heat oil on medium heat. Sauté the onions, seasoned with salt and pepper, until soft. Add the garlic and cook 1 minute, add the cauliflower and broth. Bring up to a low boil and cook for about 15 minutes, until the cauliflower is soft. 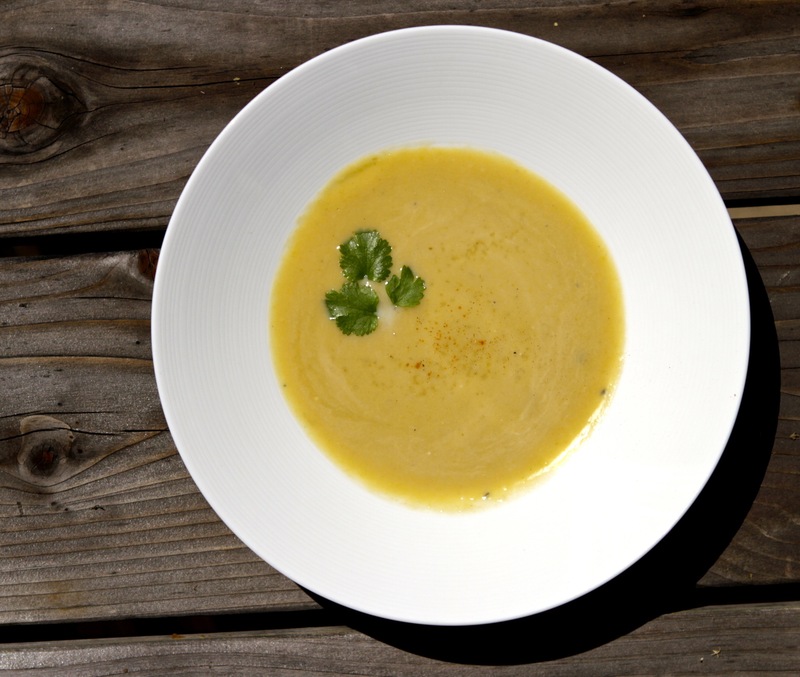 Let cool slightly, then puree with an immersion blender, or transfer to a blender. Add the milk, if using, and return to heat until warm. Very baby friendly. Also great served cool or room temperature! I kept the seasoning simple and garnished with a little truffle salt. 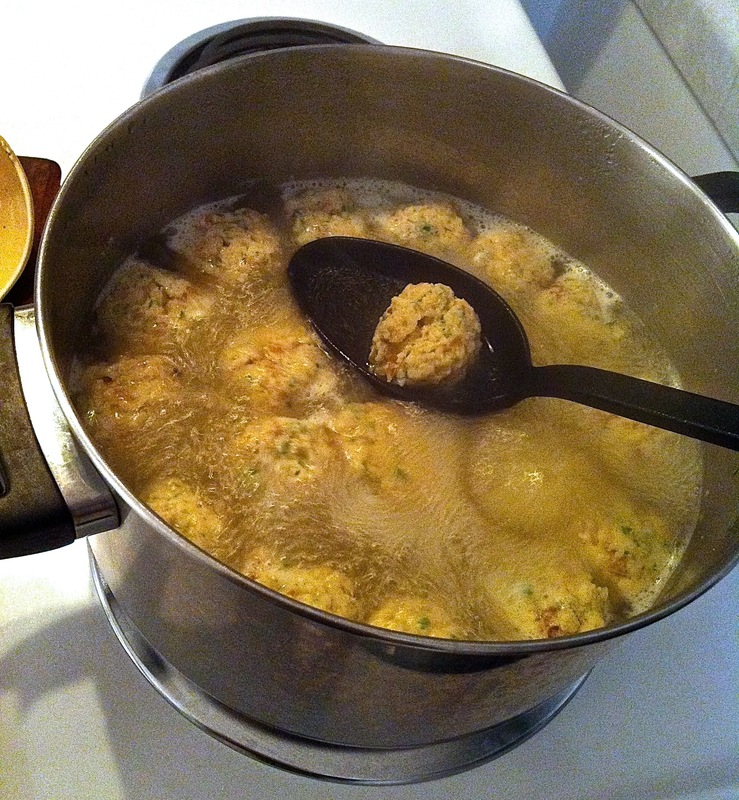 This is my great-grandmother’s recipe for Matzo Ball Soup. It was transcribed at one point by my mother for a synagogue cook book. I still use the tattered book, lined with my notes over the years in pencil. I have updated it minimally by using fresh herbs, instead of dried (which I imagine is probably closer to how my great-grandmother, Mower, made it.) Mower likely started from whole matzo rather than matzo meal, but I like to believe she would approve of the modern convenience. They are light, fluffy and flavorful, and simply the best. I can rarely eat a restaurant matzo ball as they just can’t compare. Passover is by far my favorite Jewish holiday. It is all about a big dinner party! Although I am not particularly observant, I love to celebrate Passover by hosting a seder. Apart from our favorite family recipes (it’s like a 2nd Thanksgiving!) I do love the message and the story of freedom. Passover starts this year (in North America) on the evening of Monday, March 25th. But I wanted to share this recipe ahead of time. The “secret ingredient” to Mower’s Matzo Balls is schmaltz, or chicken fat, in which onions are slowly caramelized. As there is a lot of cooking for Passover, I like to make the chicken broth and schmaltz the weekend before. 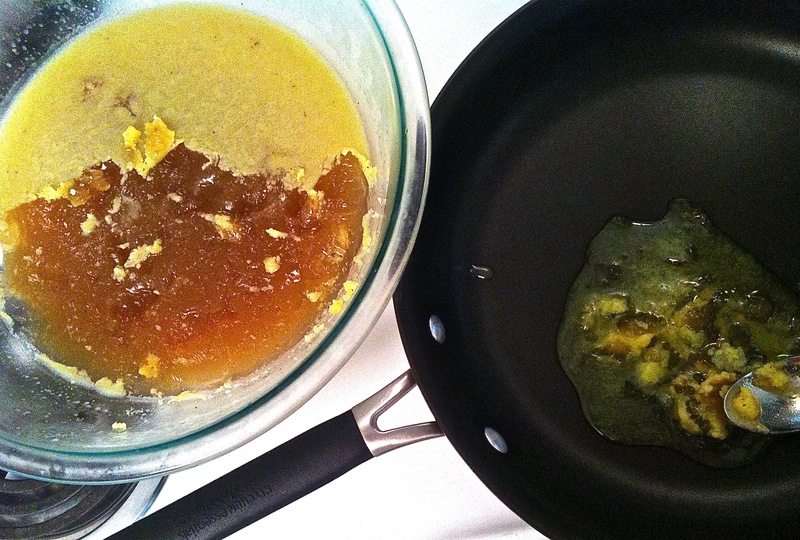 There are at least two methods of preparing schmaltz. You can render the chicken fat by cooking down the fat and skin. Here is a how-to post with step by step pictures. I find it simpler, however, to just make a homemade broth and then skim off the fat layer that congeals at the top when cooled. Don’t make them too big. 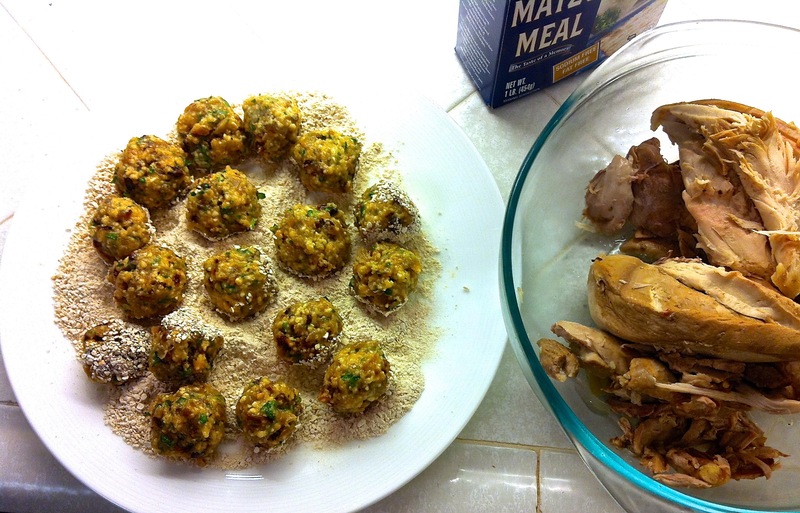 The balls will nearly double when cooked, so start off with a small walnut-sized ball. Really let the onions slow cook and caramelize in the chicken fat and don’t skrimp on the schmaltz. A light touch when forming the matzo balls is key. Don’t over handle them. The broth and schmaltz can be made a week ahead of time. The onions can be cooked the day before and stored in the fridge. But don’t let the batter sit more than 1 to 3 hours or it will get too dense. And don’t cook the matzo balls too far ahead of time or let them sit in soup. Just before the seder, cook them the first 10 minutes. They can wait for the length of a seder, then just before serving, cook the final 10 minutes in broth. On medium low heat, sauté the onions in fat in a covered pan until golden and very soft. Cool onions. (Can be stored in refrigerator 1 day in advance.) Beat together the eggs until light and fluffy. Add the matzo meal, seasoning, herbs and tablespoon of broth. Cover and refrigerate 1 to 3 hours. Roll into approximately 16 to 18 balls about the size of small walnuts (use a teaspoon to scoop up batter and dust hands with extra matzo meal to combat stickiness.) Drop balls into a pot of boiling water and cook for 10 minutes. Then transfer to hot broth with the carrots for another 10 minutes before serving. Add the chicken just at the end to reheat. Place washed chicken in a large pot and cover with water. 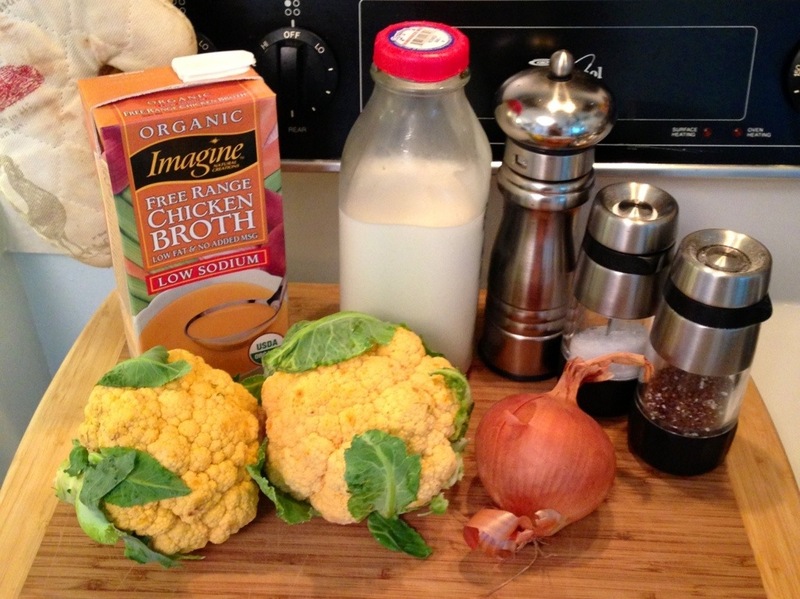 (You can cheat and intensify the flavor by using a little prepared chicken stock or broth.) Bring to a fast boil and skim off any scum that rises to the top. Rough chop the onion, celery, carrots, and parsnip and add to the soup with garlic, pepper, salt and bay leaf. (If you are using a prepared stock, consider skipping added salt.) Simmer for 20-30 minutes or until the chicken is just cooked. Remove just the chicken. Remove the meat from the bones and set aside. This helps prevent over-cooked meat. Put the bones, fat and bits back into the pot and continue simmering for 2-3 hours. Keep the water level just covering ingredients. Strain the soup through a sieve, discarding all solids and chill to congeal fat on top. Store in the fridge up to one week or freeze. Jewish Penicillin!! I grew up in the Carmel/Monterey area. Like San Francisco, Monterey claims cioppino, an Italian-American tomato-based seafood stew, as its own. 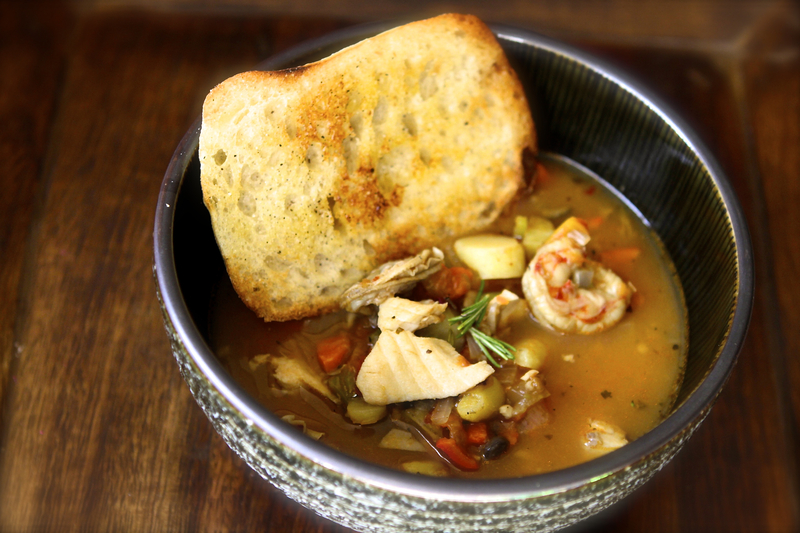 We would typically find it in restaurant/seafood markets, the kinds that sold clam chowder in a sourdough bread bowl, and featuring the catch of the day: fish, shellfish, calamari… Everyone knew that a good cioppino was dependent upon good fresh, seafood. Then about five years ago, while my now-husband and I enjoyed a quiet bowl of cioppino, after a day of workshops and hot tubs at Esalen, outside, overlooking the Pacific, I had an epiphany. Was it the breathtaking setting that made this the best bowl ever? Was it a full day of healing hot springs and life changing work? Maaaaayybe. But I concluded it was fresh vegetables! Esalen, an institute in Big Sur, was founded by hippies 50 years ago to foster the “human potential.” Before that, it was a hotel, frequented by Henry Miller, and Hunter S. Thompson was a not so reliable employee. As early as 2600 BC, the land was home to the Esselen Indians and revered for the sacred hot springs, located on the edge of dramatic cliffs above the Pacific Ocean. When I was growing up, my dad often took my sisters and I to the pool and hot springs. We would walk in the back entrance, acting like we owned the place, a technique he perfected, whether it was the “clothing optional” Esalen pools or the Four Seasons. Today, the only way to stay there is to sign up for a workshop (or personal retreat). It is pricey, but oh, so worth it. In my opinion, one of the highlights of the experience is the food. Almost all of the produce is grown there on the grounds. Their practices of biodynamics and permaculture, self-sustaining and organic, have greatly influenced the way Papa Bird and I approach our own home garden. Tasting and analyzing that satisfying cioppino, I was confident that all of the tomatoes and vegetables came from their garden, a few hundred feet from the kitchen. Disgustingly fresh. I’m willing to bet the fish markets used canned tomatoes or paste. My cioppino epiphany? The freshness and quality of the vegetables is as much as, or more, important as the freshness of the seafood. Like my Spanish Stuffed Peppers, this recipe is only an approximation based on tasting, but we enjoy it! We love it served with crusty garlic bread, although sourdough is traditional, and by skipping the bread, it makes a great gluten-free, paleo or low-carb entrée. (It can simmer for longer at this point if you would like to make it ahead, and then add the the seafood just before eating.) Bring back up to a low boil and add the seafood and fish. If using frozen seafood, add them frozen, do not defrost. Cover with a lid and cook for 2-4 minutes until mussels open and seafood is cooked. Some thoughts on seasonality: Really this dish is at its peak in the late summer when tomatoes shine. Check out my post on freezing summer tomatoes for use throughout the year. We were craving this dish this winter, so enjoy anytime. On the seafood: Crab is classic in San Francisco. In San Diego we have access to good, sustainable mussels. Use whatever is available and that you like! For advice on sustainable seafood, I love the Monterey Bay Aquarium’s Seafood Watch and use their iPhone app. When I was a kid I hated beets. I went so far as to refuse to carry the serving bowl of beets when my mother asked us to help set the table. The bread I would carry, green beans, sure, but no way would I touch the beets. Now they are one of my absolute favorite vegetables. Did you know that beets have been considered an aphrodisiac since the time of the ancient Romans? They have also been used for medicinal purposes, as well as a natural red dye since at least the 16th century. No wonder these all natural red velvet cupcakes I made for Valentine’s were such a hit! I most often roast them in large chunks with a little coconut or olive oil and salt and pepper. Leftovers, if any, are great in salads the next day. The tops of the beets, or beet greens, can be sautéed like collards, kale or any greens. My second favorite preparation of beets is being featured in this soup. Borscht has been made in Eastern European countries, like Russia and the Ukraine, since the 14th century. It’s hearty, economical, and for those with New Year’s Resolutions, filling while being low in calories. Although they are naturally sweet, and contain about 10% natural sugars, 1 cup of beets has only 50-75 calories. For this recipe, and all of my recipes, please feel empowered to improvise and substitute ingredients. The only essential one is beets! The recipe works equally well with vegetable broth, making a satisfying vegetarian meal, although beef broth is nice, too. You can even throw in beef stew meat chunks, especially for a chunky borscht. I used a big potato, parsnips and some carrots from our garden, along with other veggies. In a large soup pot over medium heat, sauté the onion and carrots for five minutes in the oil with salt and pepper, and then add garlic. Add the hard, root vegetables (beets, turnips, potatoes, parsnips) and the broth. Add enough water to cover all of the vegetables. Bring to a boil and then lower to a steady simmer. Simmer for 30 minutes and then add the cabbage, simmer for another 10-15 minutes. Adjust the seasoning and add paprika. Add the vinegar or lemon juice to taste. Option 1: Serve as is as a nice chunky borscht. Top with greek yogurt, creme fraiche or sour cream and fresh dill. This makes great baby food, from months 8 or 9 on.